Here we are ... already October 6th! We'll be putting up Christmas trees before we know it ... but before that happens, I'm sharing a bit more of our Fall home. 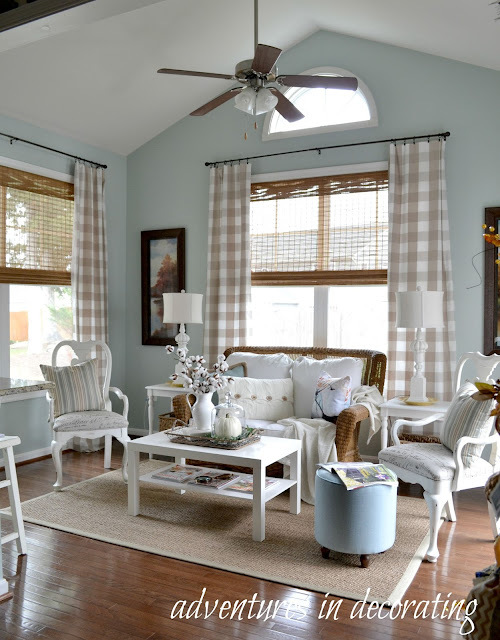 Come on in to our little sunroom, right off of the kitchen. 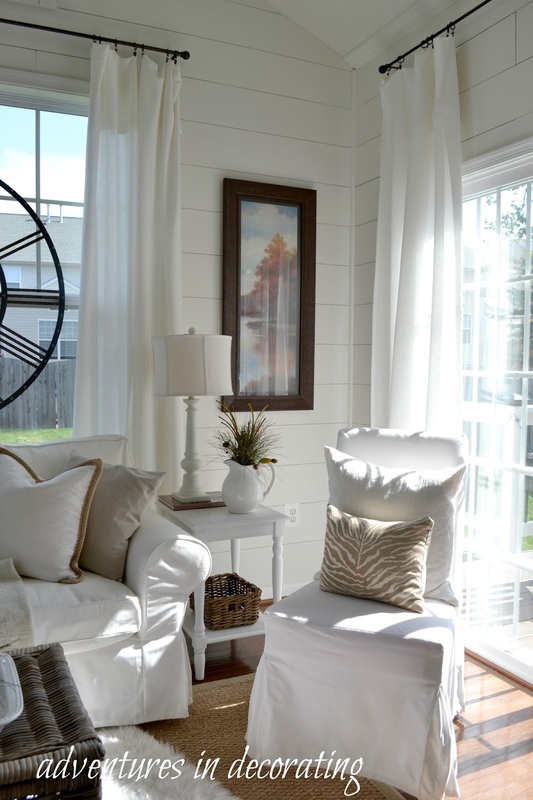 I know I've said it before, but this is the room where I find myself tossing pillows from the love seat ... grabbing a magazine ... and relaxing, well, if not snoozin'. 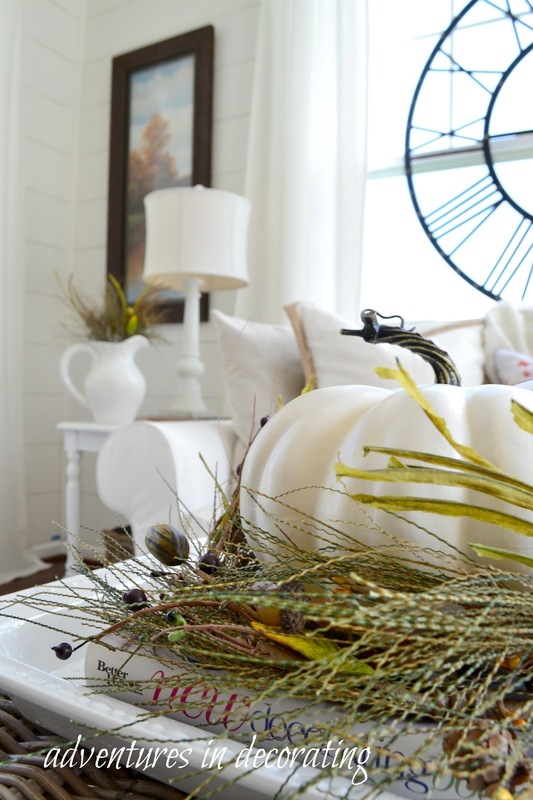 Just for fun, let's look at where this room started the Fall we moved in two years ago ... we had painted the walls Manchester Tan and there was lots of seasonal color! Then, the next year, the walls *magically* turned Ben Moore's Palladian Blue ... and furniture, curtains and the rug were traded for other pieces we had in other spots in our home. I loved this wall color and will be adding it somewhere else in our house! Then, not too long ago, the walls got a new "planked" look that were then painted White Dove, which we absolutely love and wish we'd done sooner! At least there is one Fall "constant," and that is the pretty autumnal prints I found at Home Goods a couple of years ago. See, I "do" keep some items! 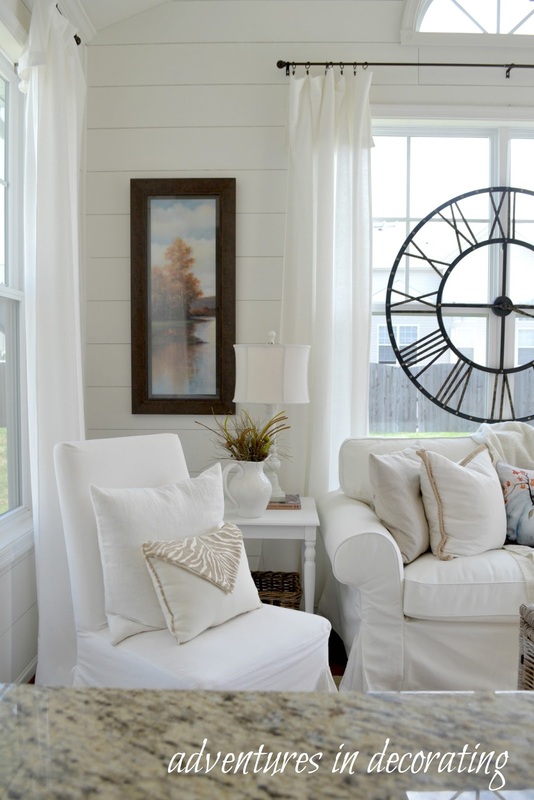 When I put this room back together after planking the walls and removing the bamboo shades, the window just needed "something" ... that's when our oversized clock from Kirkland's came up from the basement to become a focal point. I like how it "balances" the Fall prints, too! While there are a few little pieces of rust and orange, I tried to keep the soft muted seasonal tones going in here, too. It's hard to believe that in just a few weeks, these prints will come down and up will go something welcoming the "most wonderful time of the year!" I hope you'll come back then to visit! I can see why you like to sit in here, Beccca, very inviting, love how the light comes in the room. I am with you, loving my white walls too!! 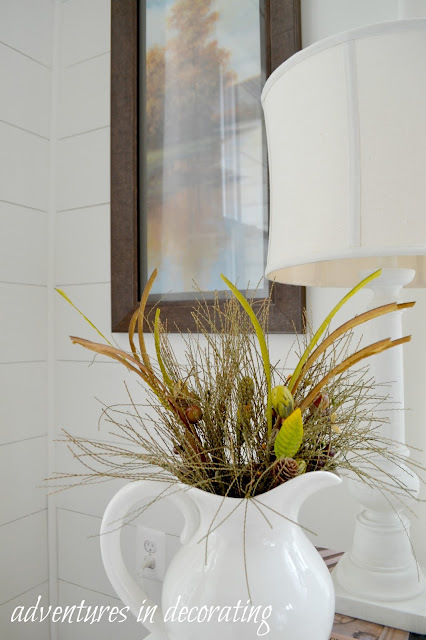 LOVE the new look with the planed walls and my favorite new paint color White Dove. I want my main living areal painted in that if I can ever hire it out! OMG! 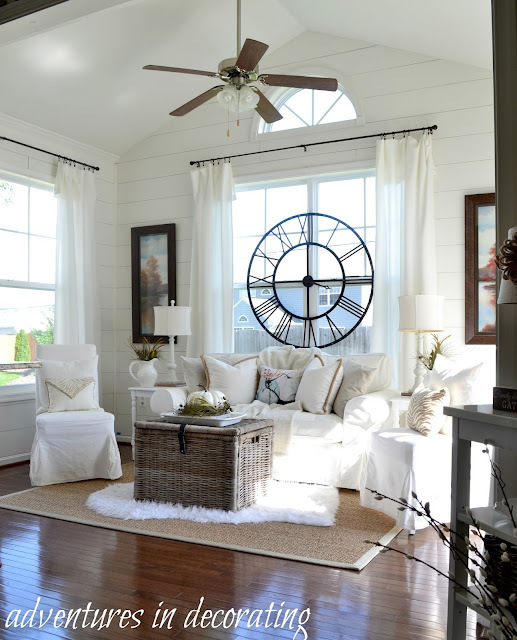 I love it...the clock looks amazing centered between the windows, very clever idea. 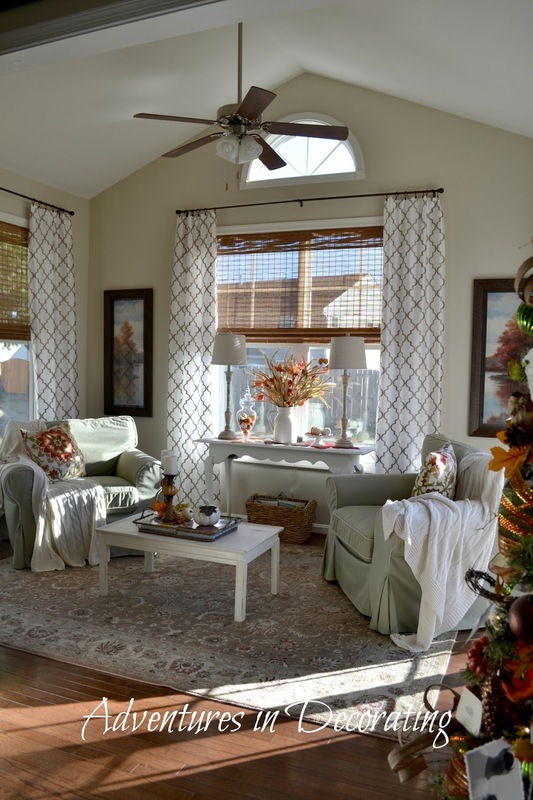 Beautiful sunroom! your room is lovely! The planked walls really adds to the over all look. The clock on the window is so clever, looks amazing! 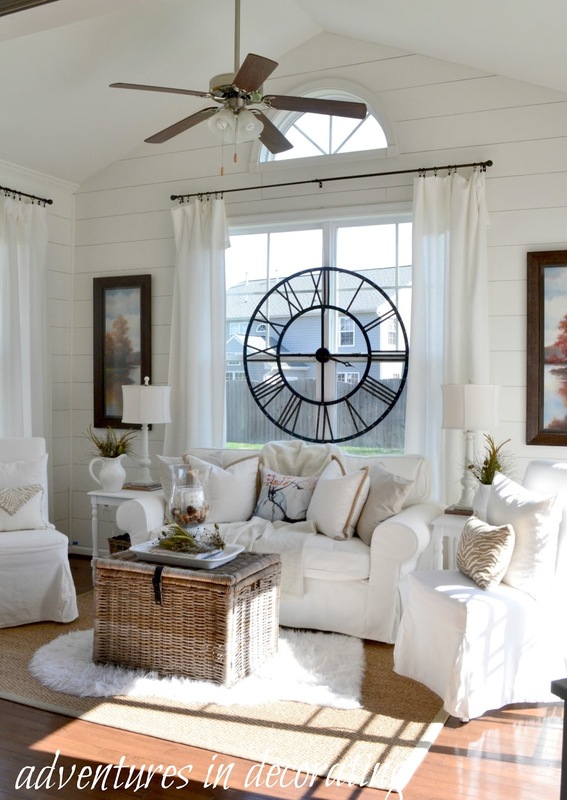 Even though I decorate with color, I do love the all white and neutral color schemes. Very cozy for fall! Your home is one of my favorites! Beautiful lovely bed linen and home decor product. How many range of these. Very beautiful pictures you have shared. you can try suzani embroidery to give a elegant look to your home. I must say that your overall white decor is simply clean and remarkable. good job. You may like to explore some beautiful curtains for living room just to get more inspiration. Could you tell me where you purchased the drapes? 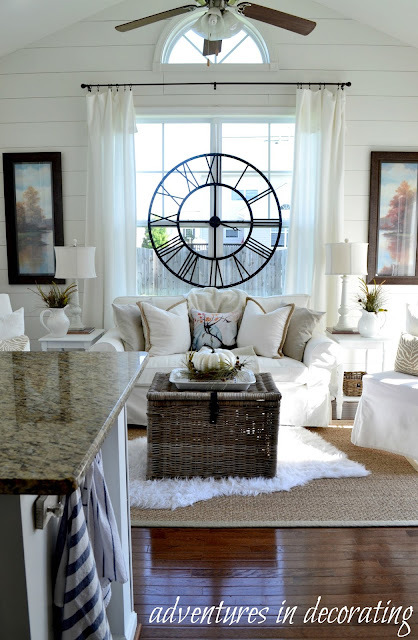 Its So Lovely... love this home decor .very clever idea. good job.